Owning shares is a dream most people have shared at some time or other. But many people also fear the perceived risk in doing so and for this reason, hesitate. But did you know that if you understand something about options and you're thinking of owning shares, you could be using options to buy stocks at a much cheaper price than if you just went to your broker and simply bought them? Let's take an example to illustrate how it works. Let's assume the shares of a company are currently trading on your local stock exchange at $35 and you believe they would be a value investment if the price falls another $5 or so. You may have concluded this for any number of reasons. For example, you may have looked at a daily price chart of the stock and noticed a longer term trading pattern such as a "channel" (highs and lows between two parallel lines) or observed a strong price support area. This leads you to believe that it won't be long before the price will fall to say $30 in the near future, at which price, the shares are worth buying. You understand the advantages of using options to buy stocks. Another reason could be, that you're an investor who looks at the fundamentals of the company. You've noticed that the Price/Earnings Ratio is lower and have concluded that $30 is a good price to buy. Or you might be a short term stock trader and you've observed this stock's price starting to fall in such a way that is consistent with past movements of a similar size. So you believe it is likely to reach $30 sometime within the next month or so and you're happy to buy it at that price because you are confident that it will turn around and head north again. You've educated yourself about using options to buys stocks. Or you just be an investor who likes using options to buy stocks to hold for the long term and would like to get a better deal on purchase price. You like using options to buy stock as part of your investment strategy. Shares in a company are trading at $35 today and you're prepared to buy them if and when the price reaches $30. You would need sufficient funds in your broker account to purchase the stock at the $30 price tag in order to utilize this strategy. When the stock is trading at $35 or less, you would SELL "out of the money" put options with an expiration date the following month and an exercise price of $30. Selling option contracts is sometimes called "writing" and the process involves creating them out of nothing. This option contract with a $30 exercise price means that you are willing to allow the market to "put" shares to you at $30 each up until the agreed option expiration date. In consideration for giving this right to others, you would receive a premium which would be credited to your account. The premium is yours to keep, no matter what happens after that. Let's say your receive $2.50 for each share and you sold 10 put option contracts. Assuming that each option contract covers 100 shares, you would receive $2,500 (10 x 100 x $2.50). (1) The share price could fall to $30 or below by the option expiration date. The options would probably be exercised and you would be forced to buy the shares at $30. 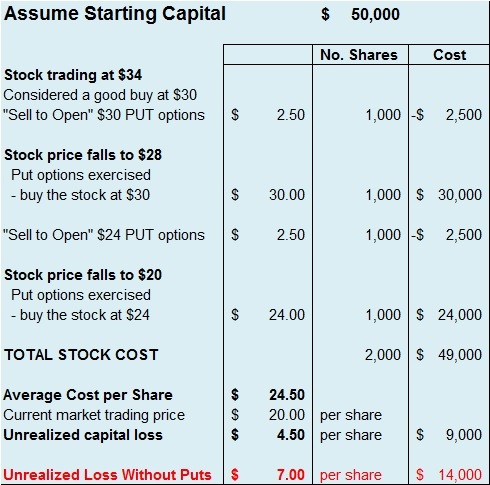 1,000 shares would cost you $30,000 less the $2,500 you received for selling the put options. $30,000 - $2,500 = $27,500 and this means that the effective cost to purchase those 1,000 shares is only $27.50 per share. (2) The share price never falls as low as $30, in which case you simply keep the $2,500 you received from selling the options and walk away with a profit. But let's say that the market price of this company's shares had fallen to $28.00 by the time your put option contract expired. You would be obliged to purchase 1,000 shares at $30 but the whole deal would still only cost you $27.50 per share. If you had not used this put option strategy and had waited instead to buy when the price fell to $28, you would've paid $28,000 and be out of pocket an extra $500 - so you're still ahead! Now that you have purchased 1,000 shares, the next thing you may wish to consider, is to immediately sell (write) "out of the money" CALL options on those shares. The preferable strike price in our example would be at least $30 but higher is better - that way, if the share price rises, you make some gain on the shares, if exercised. But if the price keeps falling, the call options might expire worthless and you simply keep the income, thus further reducing the overall cost of your purchased shares and offsetting any capital loss. If the share price continues to fall and if you still have more funds available, you could use an averaging strategy to buy more of this company's shares, but this time for say, $24. Let's say the price has fallen to $28 as above and you have purchased your 1,000 shares at $30 but remembering that thanks to your option strategy, your effective cost was only $27.50. You now immediately sell a further put option contract with next month's expiration date but this time with an exercise price of only $24 receiving a further premium of $2.50. If the share price doesn't fall as low as $24 by the new expiration date, you keep the premium and it further offsets the cost of your original 1,000 shares - which instead of $27.50 now effectively cost only $24.50 per share. Remember, if you had bought the shares at market prices without using put options, at this point your cost would be $30 per share. But let's imagine that some negative news for this company appears and it's stock price fell as low as $20 by the new option expiration date. Your sold put options would oblige you to buy the shares at $24 less your $2.50 premium received for selling the options - a total cost of $21.50 per share. 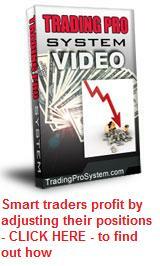 You now own 1,000 shares costing $27.50 and a further 1,000 shares costing $21.50. That's 2,000 shares at a total cost of $49,000 or $24.50 per share. If you had purchased these shares without using options to buy stocks, i.e. just "averaging down" instead, they would've cost you $54,000 all up, or an average $27 per share. With the market price now traveling around $20 per share, your unrealized capital loss at this point would be $7 per share, or $14,000 for 2,000 shares. But let's remember, you never realize a loss until you sell the shares. Your strategy may be to hold them until the price rises again and receive dividends in the meantime. Bear in mind, this is a 'worst case' scenario. A company whose stock price has fallen from $30 to $20 in two months is either in trouble, or there's big economic news about. So even when the market is taking a dive as described above, where the stock price has fallen over two months from $35 to only $20 - if you had sold put options as part of your strategy, you would be better off by 2,000 x $2.50 or $5,000. This is a 10 percent discount after brokerage costs. Now that the price has fallen to $20 you simply do it again for next month and receive another premium which will offset the overall cost of your two previous purchases if the price begins to rise again. By using options to buy stocks, you will eventually own shares in your chosen company at a discounted price which in the long run will mean greater capital gains. "Using options to buy stocks" as outlined above, is one of the strategies taught in greater depth in the popular Options Trading Pro System series of videos.